Makalu base camp trek is one of the most popular wilderness trekking destinations among lonely trekkers, Makalu Base Camp Trek offers an excellent opportunity to discover high-altitude terrains, snow-clad landscapes and cultural Himalayan lifestyle. Our Trek starts with an hour-long flight to Tumlingtar whereas the real trek starts from Chichila. The lower reaches of the trail are well-known for their lushness with verdant rhododendron forests whereas the upper reaches of the trail comprise of polished granite cliffs capped by hanging glaciers, overflowing with waterfalls. The 22-day Makalu Base Camp Trek is an ideal choice for avid trekkers and nature enthusiasts who seek solace and tranquility in pristine natural habitat and those who wish to avoid crowds. This one of fines Nepal trekking to the base of Mount Makalu (8485m) the world's fifth highest summit goes through pretty terraced farmland and a number of delightful villages, lovely high grazing areas close to the tip of the Barun Glacier and climbing to cross the Shipton La (4125m). At the high points of this classic trekking holiday, the views extend from Makalu to distant Kanchenjunga. We have a full day to explore above Sherson, gaining surprising views of the Kangshung (east) Face of Everest as well as close-up perspectives of the impressive Chamlang and of Makalu's towering South Face. It is important to note that this is a holiday for the connoisseur of Himalayan trekking and those with an adventurous spirit. 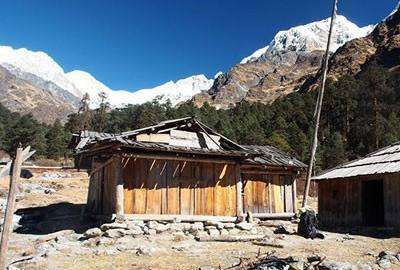 Tea houses are not as common place in this region and the lodge accommodation we will be using is of a more basic standard than that found in the popular trekking areas, such as the Khumbu. This is one of the only disadvantages of trekking in such a pristine, remote and little visited area. If you are not open to ‘roughing it' in this way, we would suggest that this may not be the holiday for you. Please call our office if you have any concerns about this. One of the finest trekking in Nepal, Cross the Shipton La to the south side of Makalu . Day 04: Trek to Num (1,572m/5119 ft), 5-7 hours. Day 05: Trek to Seduwa (1,500m/4922 ft): 6-7 hours. Day 06: Trek to Tashi Gaon (2,105m/6890 ft): 4-5 hours. Day 07: Trek to Khongma Danda (3,500m/11,483 ft): 6-7 hours. Day 09: Trek to Mumbuk: 6-7 hours. Day 10: Trek to Yangri Kharka (3,557m/11,670 ft): 6-7 hours. Day 12: Trek to Makalu Base Camp: (4,870m/15,978ft): 6-7 hours. Day 14: Trek to Yangri Kharka: 6-7 hours. Day 16: Trek to Khongma Danda: 5-6 hours. Day 18: Trek to Seduwa: 4-5 hours. Day 19: Trek to Num: 5-6 hours. Day 20: Trek to Tumlingtar: 6-7 hours. Day 21: Fly to Kathmandu: 50 mins flight. Day 22: Fly back home. Day 01 :Arrival in Kathmandu (1,300m/4,264ft) Meet and greet in Kathmandu airport and our Wilderness Excursion company staff will pick you up from the airport and take you to hotel. In the afternoon, we may take a rest or visit around. A short briefing about your trek. Overnight in Kathmandu. No meals included. Day 03 :Fly from Kathmandu to Tumlingtar then drive to Chichira (1,980m/6497ft) Takes flight to Tumlingtar of 50 minutes after breakfast and meet the rest of the crew members who will also be joining us for the trek. Next, we drive to Chichira, a small Gurung village. We take a rest at Chichira as we need to be prepared for the next day’s trek. Overnight in Chichira. Meals included: Breakfast, Lunch and Dinner. Day 04 :Trek to Num (1,572m/5119 ft), 5-7 hours. We start early in the morning and head towards Num right after a warm breakfast. A moderately paced walk through the picturesque villages and lush mountain forests will take us to Num. A ridge line with great views on both side and perched on the end, this is Num for us. Overnight in Num. Meals included: Breakfast, Lunch and Dinner. Day 05 :Trek to Seduwa (1,500m/4922 ft): 6-7 hours. A steep descent through forests and terraced farms takes us to Barun River. We cross the river and follow an equally steep ascent up the other side again. Often quite hot - the forest on the valleys offer a bit of shade. This is where Makalu Barun National Park begins and where we register our permits. We camp right at the top of the village. Overnight in Seduwa. Meals included: Breakfast, Lunch and Dinner. Day 06 :Trek to Tashi Gaon (2,105m/6890 ft): 4-5 hours. Ascend the ridge bounded by the Ipsuwa Khola on the west and Kasuwa Khola to the east. Crossing the hillside through quiet villages and passing by small paddy fields, we reach the exotic village of Tashi Gaon. Once there, we are surrounded by breathtaking Himalayan panorama. Overnight in Tashigaon. Meals included: Breakfast, Lunch and Dinner. Day 07 :Trek to Khongma Danda (3,500m/11,483 ft): 6-7 hours. This will be a bit of a tough day as we have to walk on a steep trail in higher elevation. We will ascend through forests to a stream and then onto a ridge. From here the trail gets even steeper and passes a Kharka (grazing land) and finally follows a series of rough stone stairs and small lakes ascending to the top of the ridge. From here it’s a short way down to Khongma Danda. Overnight in Khongma Danda. Meals included: Breakfast, Lunch and Dinner. Day 08 :Rest and acclimatization day The day off will allow some bodily rest before we take on crossing of the Shipton La the next day. For those who wish to explore the nearby surrounding can walk around the area. Overnight in Khongma Danda. Meals included: Breakfast, Lunch and Dinner. Day 09 :Trek to Mumbuk: 6-7 hours. Climb towards the summit of the Shipton La (4125m) which takes a few hours to reach. After the Kalo Pokhari Lake the height of 3930 meter, pass over the Keke La at 4,170m. We can see the marvelous views of Chamlang (7321m), Peak 6 (6,524m) and Peak 7 (6,758m). After crossing the Keke La pass, we descend through the beautiful valley to Mumbuk. Overnight in Mumbuk. Meals included: Breakfast, Lunch and Dinner. Day 10 :Trek to Yangri Kharka (3,557m/11,670 ft): 6-7 hours. We trek to Yangri Kharka today passing through the rhododendron forest which leads to the Barun River and the upper reaches of the valley. We should be very careful during the first two hours of trek as the trail is steep and arduous. We then take a pleasant walk, slowly gaining altitude until we arrive at Yangri Kharka situated at the base of the valley. Overnight at Yangri Kharka. Meals included: Breakfast, Lunch and Dinner. Day 11 :Trek to Langmale Kharka: (4,410m/14,468ft): 5-6 hours Following a moderate walk to the valley, we pass through yak pastures, lush forests and boulder fields. The valley walls tower imposingly above us during the start of the trek. We pass Merek as we make our way further up and notice a significant rise in the scenic Himalayan views. Overnight in Langmale Kharka. Meals included: Breakfast, Lunch and Dinner. Day 12 :Trek to Makalu Base Camp: (4,870m/15,978ft): 6-7 hours. Today is the day we make it to the Base Camp. From Langmale Kharka we make our way up to Shershong and eventually to Makalu Base Camp. The trail is flat with icy glaciers and snow clad mountains accompanying us. Mount Makalu comes into view as we approach Shershong. As we make our way to the camp, we get to soak in the majestic Himalayan panorama surrounding us. Overnight at Makalu Base Camp. Meals included: Breakfast, Lunch and Dinner. Day 13 :Excursion Makalu Base Camp The Base Camp is a rocky barren place with the large Barun Glacier beyond it. From here we can see the magnificent south face of Makalu and the complete panorama of Everest and Lhotse. We can explore the surrounding lakes, glaciers and go for a short trek up where we may celebrate our accomplishment at the camp itself. Overnight at Makalu Base Camp. Meals included: Breakfast, Lunch and Dinner. Day 14 :Trek to Yangri Kharka: 6-7 hours. We trek down from the base camp and take our last glimpse of Makalu before turning the corner and heading back. On our way down, we pass through Shershong, Langmale Kharka, Merek and descend down the valley finally stopping at Yangri Kharka. Overnight at Yangri Kharka. Meals included: Breakfast, Lunch and Dinner. Day 15 :Trek to Mumbuk: 6-7 hours From Yangri Kharka we descend through rock falls, green forests and valley, making our way towards Mumbuk. We follow the river banks of Barun as we descend down the trail. Overnight at Mumbuk. Meals included: Breakfast, Lunch and Dinner. Day 16 :Trek to Khongma Danda: 5-6 hours. We begin the trek from Mumbuk (Nambuk) and through a forest of firs and rhododendrons. We then cross the Keke La, Tutu La (Shipton’s Pass) and Kauma La en route. Next, we descend to Khongma Danda again. Overnight in Khongma Danda. Meals included: Breakfast, Lunch and Dinner. Day 17 :Trek to Tashigaon: 4-5 hours The trek continues with frequent long and steep descent cutting through the hillsides. The trail takes us through thick forests and finally making it to the indigenous Sherpa village of Tashigaon. Overnight in Tashi Gaon. Meals included: Breakfast, Lunch and Dinner. Day 18 :Trek to Seduwa: 4-5 hours. We retrace our steps as we exit the Makalu Barun National Park and descend down to the Barun River. We then cross the hillside and come across villages and settlements as we move further down finally stopping at Seduwa again. Overnight at Seduwa. Meals included: Breakfast, Lunch and Dinner. Day 19 :Trek to Num: 5-6 hours. We leave Seduwa and trek through lush forests towards Num. The trail goes up and down and passes through dense forests and Sherpa villages as we move downwards. Overnight at Num. Meals included: Breakfast, Lunch and Dinner. Day 20 :Trek to Tumlingtar: 6-7 hours. Again we retrace our footsteps to Chichira from where we can savor the glorious vista of Mount Makalu for the last time. The final return leg of the trek will see us overnight at Tumlingtar, ready for an early departure to Kathmandu the following day. Overnight at Tumlingtar. Meals included: Breakfast, Lunch and Dinner. Day 21 :Fly to Kathmandu: 50 mins flight. We fly back to Kathmandu after our long trek to Makalu Base Camp. We can rest and relax throughout the day at our hotel or get in touch with our loved ones. In the evening we celebrate our successful journey to the Makalu base camp and back with a farewell dinner. Overnight in Kathmandu. Meals included: Breakfast and Dinner. Day 22 :Fly back home. It comes to end of your trip today! Wilderness Excursion will drop you off at the airport for your way home or further destination. We will have plenty of time to plan our next adventure in the wonderful country of Nepal. Meals included: Breakfast. 3 Nights deluxe room 3 star category hotel in Kathmandu with breakfast on double occupancy basis. Kathmandu – Tumlingtar – Kathmandu by domestic flight. Flight fares for your guide and Sherpa. Guided sightseeing in Kathmandu. Can be arranged in client’s request.